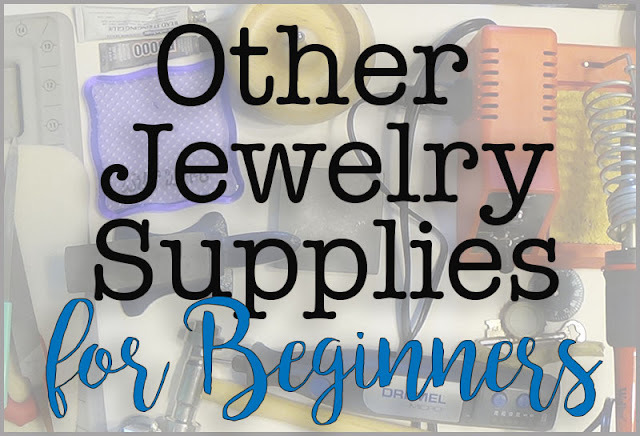 Before we move on to jewelry-making techniques, I thought it would be a good idea to quickly review some of the other materials used to make jewelry. The materials I'm reviewing in this post are not ones that are necessary to have for all jewelry-making types. In fact, you may not need any of these at all. As well, I'm not even breaking the surface of all the jewelry supplies out there on the market. But, I felt that it was necessary to go over what some of these items are and how they might be used, especially since you may see them in future tutorials. Bead Mat: This is simply a square of soft, fuzzy fabric. 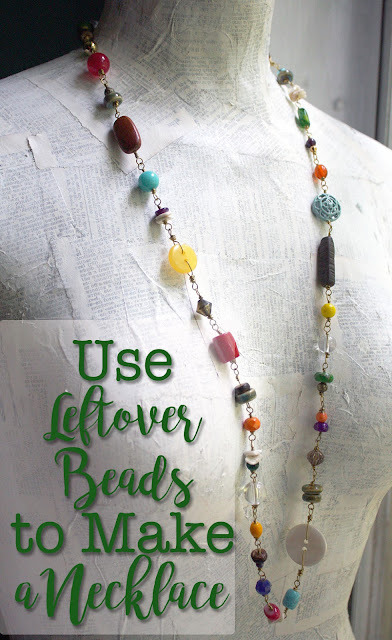 It's used for working on and keeps your beads from rolling away. I've seen them in the size shown above as well as a larger version. While it's nice to have one or more of these, a towel or washcloth works just as well. 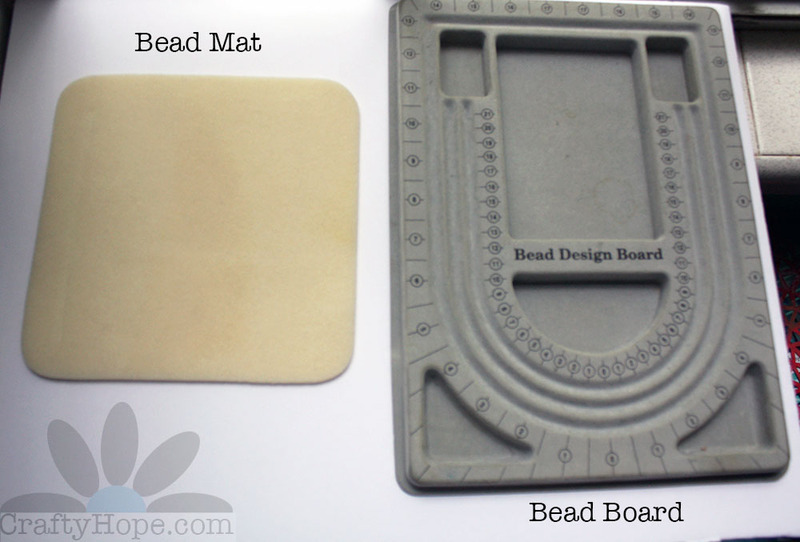 Bead Board: Much like a bead mat, a bead board is used to contain your beads while you work on a project. It has several recessed, bowl-like areas to hold your beads. As well, there are grooves in the surface for placing your beads as your design your pieces. Around the grooves are measurements to help you get an idea of the length of your finished designs. Wire Jig: The purple square above is known as a Wire Jig. There are other terms out there for them, mostly related to the brand or company that sells them. It's usually a small plastic or acrylic block with a grid of small holes in it. Pegs of varying sizes are placed in the holes and wire is wrapped around the pegs to create designs. I've had this wire jig for ages and haven't really used it much. Though now that I've pulled it out, I wonder why that is. It's such a cool tool. 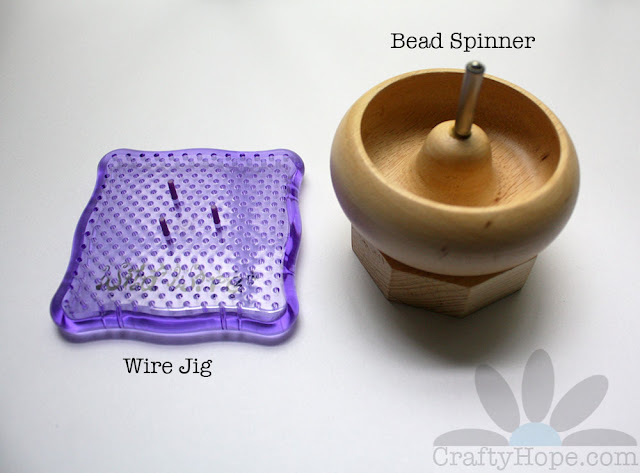 Bead Spinner: Basically a bowl that spins, bead spinners are most often used with seed beads. Used in conjunction with a curved needle and thread/wire, these are a great tool for loading up a lot of beads onto your wire or thread. You place your needle into the bowl, spin it, and the beads pile up on the needle. I've used this one a few times. It does take several attempts to get the technique right, but then it works like magic. These come in a variety of sizes. Bench Block & Anvil: These two work basically the same way. They are simply a supremely hard surface on which you can hammer. This is great for flattening wire, texturing metal, hammering items flat, stamping words or images into metal surfaces, etc. You should place some kind of buffer between the black/anvil and your table/work surface to protect it and buffer the sound. There are sandbags and rubber mats that can be purchased specifically for this purpose. I personally use a small folded towel. 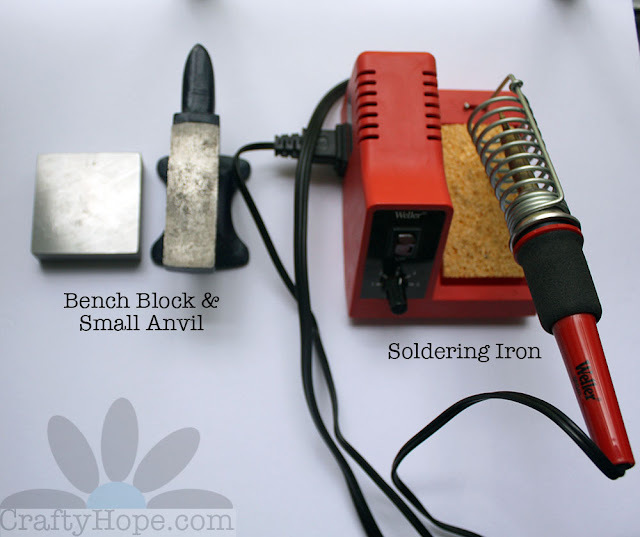 Soldering Iron: This is a basic hardware tool that can be used in jewelry-making. 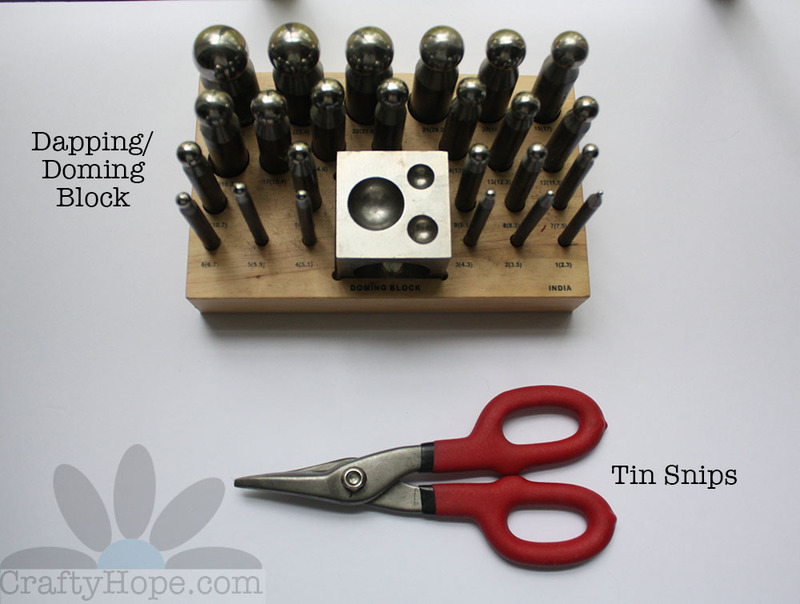 I use mine together with copper tape, flux, and solder to join items together like attaching jump rings to surfaces or soldering two glass slides together. Using a soldering iron takes practice, but can be a lot of fun. Texture Hammer: There are a variety of types of texture hammers. Some simply have a texture on one side, some are homemade from old regular hammers. The one I have has removable ends with small heads that can be interchanged for a variety of textures. These heads are banged onto the surface of the metal to create interesting finishes. Ball-Peen Hammer: This is a jeweler's all-purpose hammer. One side is generally flat like a usual hammer, while the other side is small and rounded (almost spherical in shape). The flat side is great for hammering wire flat while the small end gives a lot of texture and detail. 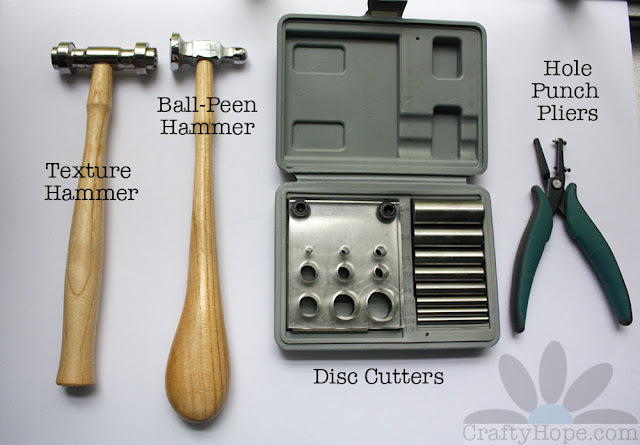 Disc Cutters: Basically what it sounds like, these tools cut discs out of metal. You slide your metal in the block, fit a matching metal sphere into the circular space, and hammer until a disc pops out the bottom. This should only take one or two hits of the hammer. I admit that I haven't perfected this technique. My disc cutter is a fairly cheap version, and you get what you pay for. There are a variety of cutters like this out there, some even cutting out other basic shapes (squares, ovals, stars, teardrops, etc. ), and they're in a variety of price ranges. Hole Punch Pliers: Again, these are just what they sound like. They punch small holes in metal, much like a paper hole-punch. There are other tools out there that will achieve the same effect (like the disc cutters), but I've found these pliers to be the most efficient, depending on the metal itself. Dapping/Doming Block: While this supply may look kinda crazy, it's purpose is totally simple: it domes metal pieces. Each of those knobs on a stick corresponds to a dome in the block. You hammer the spherical part of the stick into the dome to curve your metal. This example is a metal one, but I also have a smaller wood one that doesn't mar your material as much. Though, it's not as sturdy either. Tin Snips: The ones pictured are only one version of tin snips. They come in a variety of shapes and sizes but generally look something like scissors. They do cut tin, along with a variety of other metals, so long as they are thin enough. Some tin snips are designed to cut straight lines, some to cut curved lines. Some of the stronger/larger ones (found in hardware stores) will leave "teeth marks" on the metal, so you should be careful when selecting yours. Tweezers: I'm sure you are familiar with tweezers. In jewelry-making, they're perfect for picking up small beads, holding down small bits when gluing, or generally acting as tiny fingers. Glue: Most jewelry techniques don't involve glue, but you will come across projects, from time to time, that need it. I often use E6000 as a super glue to adhere large elements (like cabochons) to other surfaces. Bead Stringing Glue is great because it has a needle tip to get in tiny spaces. I use it especially to secure knots in threaded projects. Files: There are a variety of files out there that can be used to help make jewelry. Something as simple as a nail file can work in a pinch. But, if you're working with more industrial materials, you're going to need more industrial supplies. Pictured above are a metal nail file, a heavy-duty metal file, and a wire rounder. The wire rounder has a tiny cup on the end to help file down wire ends. This is especially great for making ear wires. Not pictured, but also key, are bead reamers. 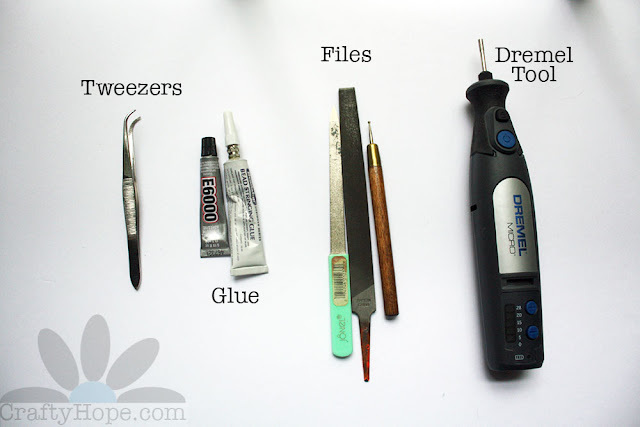 These are thin, round files that are inserted into the holes of beads to clean and file them. Dremel: Another hardware-store supply is a Dremel tool. It's a multi-purpose electric tool with interchangeable heads. It can be used for drilling, sanding, filing, buffing, and many, many more tasks depending on the head you put on it. The supplies I have pictured and mentioned here are just the tip of the iceberg. There's no way I could ever cover every little thing that might be used to help you make jewelry. You will undoubtedly uncover many more materials as you continue learning to make jewelry. I do have a video review of these same supplies if you want to see/hear that. I'm looking forward to getting to the next part of this series when I'll finally start sharing techniques with you! For now, please let me know if you have any questions, corrections, or additions to this subject in the comments. It's a good-to-know list, Hope! Thanks to my husband, I have access to more tools than I use ;) Never tried soldering, though. Oh, and sometimes he asks me for sandpaper and diamond coated files. Neat video. You’ve got some cool tools!